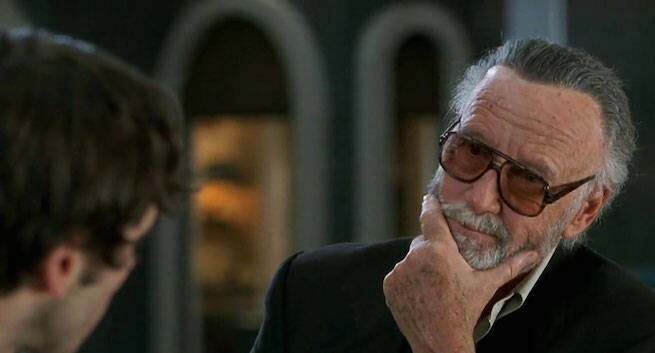 With dozens of comic book movie and TV show cameos under his belt, fans might expect that one of those movies -- in which comic book legend Stan Lee got to interact with the universe he had such an important hand in creating -- would be his favorite, right? Well, he does have a favorite Marvel movie cameo, but during a panel this weekend at Denver Comic Con, Lee revealed that his favorite movie role of all time was his 1995 appearance in Kevin Smith's Mallrats, the screwball/stoner comedy that bombed at the box office but became a cult classic on home video. "Gee, that's a hard one. I got a big kick out of Mallrats," Lee told a fan who asked his favorite film. The rest of the crowd erupted into enthusiastic applause. "But it wasn't a cameo; I really had a role in the movie. Funny thing about that: in the movie, I'm talking to the boy who was the lead, who was very unhappy becuase he was having trouble with his girlfriend, and I mentioned to him, 'I remember I once had a girlfriend and I lost her but I've never forgotten her, and I think about her all the time,' something like that. Now, I went home, and my wife said to me, 'Now what is this about that girlfriend?' And I learned you have to be very careful about how you explain movies to your wife." If he had such a good time, then, it shouldn't surprise anybody that he's in line to appear in Kevin Smith's follow-up to Mallrats, originally planned as a feature film but recently announced as a TV series. It isn't clear what the size of his role will be, but given the fact that Brodie (the character he was advising in the first film) went on to become a figure in the entertainment industry after the first movie, it's entirely possible that the two have a closer relationship and Lee could have a bigger presence than just a cameo there, too.